Audiences, as a general rule, like tricks wherein the element of surprise is greater than that of mystery. At first reading, this statement sounds absurd, for every mysterious trick is surprising, yet, an effect might surprise an audience, but not mystify it. The following card trick is an example, I believe, of this statement. The entertainer obtains the assistance of a young boy, who steps upon the stage and stands at the performer’s left, facing the audience. He selects a card from a shuffled deck and shows it to the audience. The card is placed on top of the deck by the performer. The boy is then asked to mention any number. He mentions eleven. The entertainer holds the deck face down in his left hand and requests the boy to hit the deck hard enough to force the top or selected card to take its place, eleventh from the top. This request surprises the boy, but he hits the deck quite hard. The entertainer states that he has used too much force, for he has knocked the card clear through the deck. The performer turns the deck over and shows the selected card on the bottom. The card is then placed in the centre of the deck, which is shuffled and the boy requested to try again. The cards are then counted and the selected card found to be the eleventh from the top. The explanation of the trick is simple, and there is not an original move in it. The assistance of a boy is obtained and he takes his position at the performer’s left. The deck is shuffled and he selects a card. 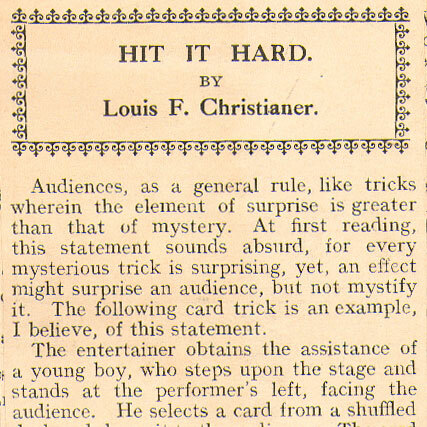 While he shows it to the audience, the performer inserts the left little finger under the top card of the deck, which is being held in the left hand. The performer takes the selected card and places it on top of the deck, at the same time requesting the boy to mention any small number. During this the performer makes the pass, bringing the two top cards to the bottom of the deck, which makes the selected card second from the bottom. The boy mentions eleven. The deck is now being held in the right hand, face down thumb at the end to the performer and the palm of the hand facing the top card, with the fingers holding the end opposite the performer. The deck is turned over and the bottom card shown, with the left forefinger pointing to it. As the deck is now turned face down the left forefinger pushes the bottom card to the right so that it will spring up and into the right palm, while the left hand takes the deck. This move is explained in the “ Art of Magic,’’ in describing Leipzig’s Four Ace Trick. The selected card is now on the bottom of the deck. The performer instructs the boy to hit the deck and himself illustrates what he means by tapping the top of the deck with the right hand. This move disposes of the card palmed in the right hand. Just as the boy is about to hit the deck the performer whispers to him to hit it hard The trick is now readily understood, for after showing the card on the bottom, it is placed in the centre, brought to the top and ten cards shuffled on top of it, after which the boy taps the top of the deck gently an the card shown to be eleventh from the top. The usual “ by-play ” with the boy should be used, such as asking him his name, telling him yours, shaking hands with him, telling him to bow to the audience, etc. Their is really nothing to the trick itself, but have found it to go well, especially in a card series where an assistant is used.